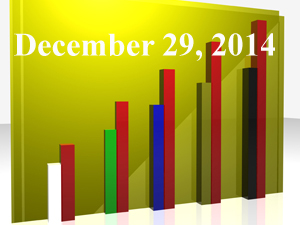 “Top Ten 2014 FiduciaryNews.com Stories,” (FiduciaryNews.com, December 23, 2014). What hints do the most popular stories of 2014 provide to what will happen in 2015? Last week was the time of year to be thinking about year-end cleaning. This is the week to contemplate the trends awaiting us in the coming year. “4 Biggest Changes to IRAs in 2015,” (ThinkAdvisor, December 19, 2014) If they change the rules often enough, if gives them a better chance to issue fines when people make mistakes. That’s one way to balance the budget. It’s the root of all evil and the bane of fiduciary duty. It’s pretty simple, yet people still try to figure out ways to find a loop hole. Here’s a hint: There are no loop holes in Heaven. “Supreme Court could redefine ERISA,” (BenefitsPro, December 22, 2014) Unlike a similar article below in the “Fees” section, this one nails the key issue in the Tibble v. Edison case and the potential fallout from a ruling favorable to the plaintiffs. And once you step into the loop hole, you take on a liability you may not want to face. Good luck with that. “Key 401k Supreme Court suit will shake up retirement plan advisers,” (InvestmentNews, December 22, 2014) It’s not quite about fees… yet. Consider this the preliminary round. The Supreme Court will determine if “fiduciary duty” means forever (hint: it does). They’ll consider overturning a lower court decision which placed a statute of limitations on fiduciary liability based on when a particular decision is made. What the lower court forgot is that fiduciary oversight is not “one and done,” it’s ongoing and forever. Once this is established, then it’s open season on fiduciaries who overlooked obvious conflict-of-interest fees. But that’s the next round. “GAO: Higher Returns Needed To Save Forgotten 401k Plans From Fee Erosion,” (Financial Advisor, December 22, 2014) The problem isn’t fees, it’s investments. The government requires these abandoned accounts to be invested in money markets or stable income funds. Given today’s interest rates, that almost always guarantees these accounts will lose money. Better they go in a demographic appropriate equity-oriented fund. Way to go Uncle Sam. It’s beginning to look like a market top, alts in every eye. And the prettiest you’ll see, is the returns that you won’t see, in your own retirement pie. “Using Preferred Stocks For Retirement Income,” (Forbes, December 20, 2014) Sure. Whatever floats your boat. Still, it looks like one of those “stretch” concepts that often pop up as markets approach their highs. “The Biggest, Year-end Move For Your 401k Plan,” (Forbes, December 22, 2014) Seriously, do editors even fact check their writers anymore? This author correctly says the Lockheed Martin settlement dealt with high fees, but then he makes a non sequitor claiming the solution is to go to index funds. And the writer purports to focus on revealing industry deceptions. He’s obviously just blown his credibility.